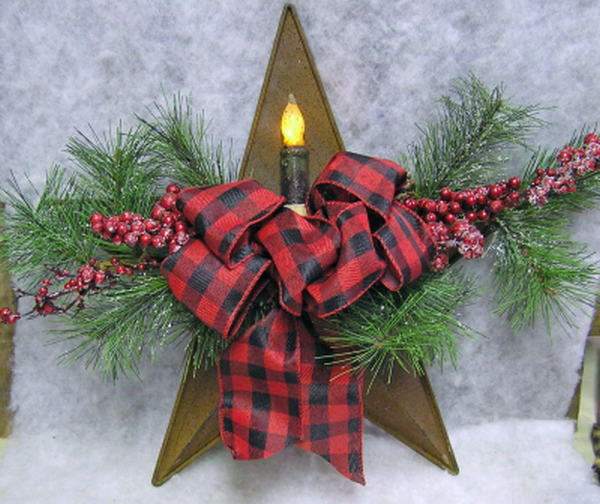 This unique star creation features a tin pocket star with snowy greens, berries, and pine cones. It has an LED rustic candle that uses 2 - AA batteries and a ribbon bow. It measures 15 1/2 x 15 1/2 x 5. 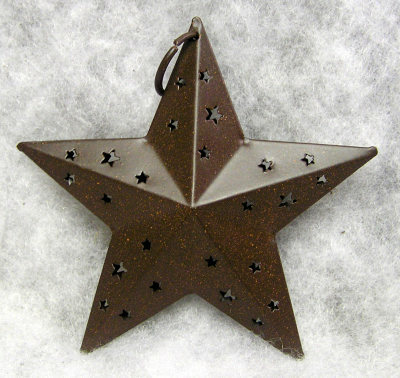 We offer a variety of 6" tin stars. 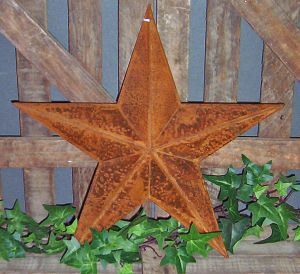 The plain tin star is pictured here and if you click on the photo you can see the patriotic tin star. The drop down will list the designs available in 6" as well as the prices. If you scroll down the page the other designs, colors, and sizes are there for you to check out. 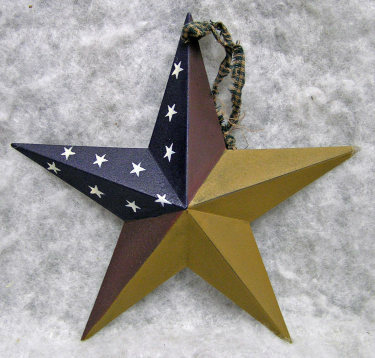 WE ARE OUT OF PATRIOTIC STARS 3 1/2"
Our medium tin stars come in a variety of designs that are listed in the drop down along with the price. 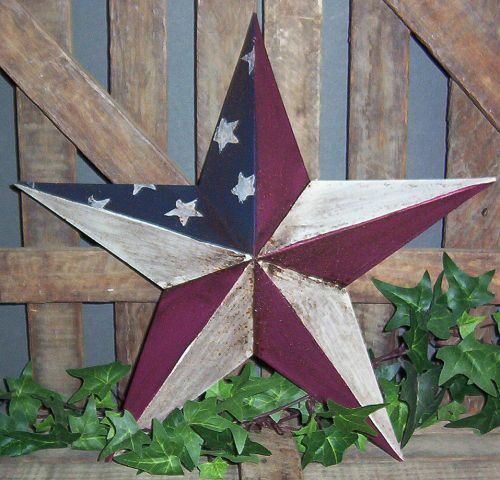 The photo shows our Maroon Pine design and if you click on the photo you will see the Patriotic design. If you scroll through this catagory you can see what the other designs look like. 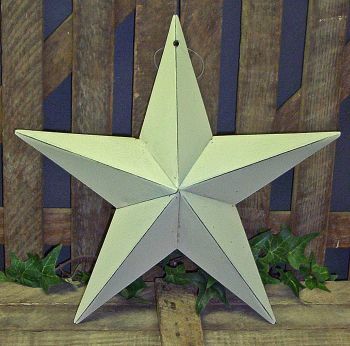 These are our medium/large tin stars and are 12" across. The photo that you see is the antique berry star and if you click on the photo you can see the cream pine star. The drop down lists the designs and prices. Scrolling through the tin star catagory will show you what the various designs look like. 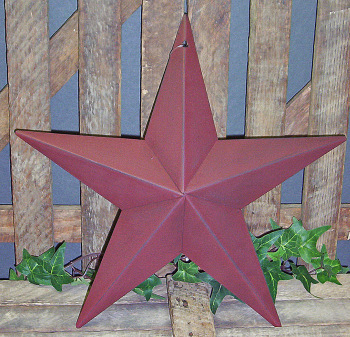 These are our large tin stars and measure 18" across. The photo shows the mustard star. 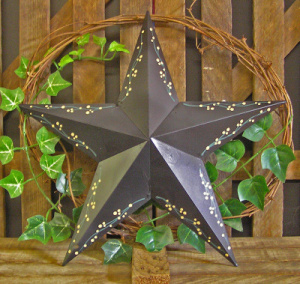 The drop down lists the 18" star designs available as well as their prices. If you scroll through the catagory you can see what the designs look like. 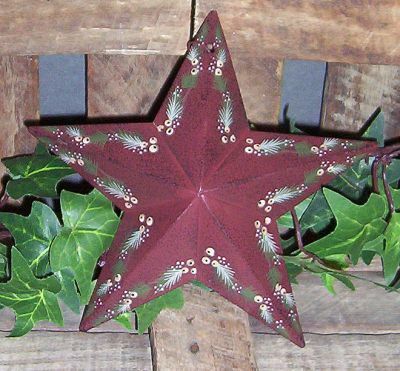 This photo shows the maroon star with pine boughs and berries. If you would like to order this design it is listed in the small to xlarge tin star catagories above. This 3 dimensional tin star has cut outs and a metal hanger.